pack ice in Hudson Bay, Churchill, Manitoba, Canada. Well the guys headed out without me today - I had some catching up with work to do so I graciously declined the outing. While I was cozy and warm in front of the computer, Rolf and Thomas were out searching for polar bears and today their efforts paid off. I guess I was wearing the wrong perfume! At the end of the day they returned reporting to me about what a "zoo" it had been out there ... in more ways than one! Along with a lot of activity in the wildlife department there were also a lot of tourists out and about in rental vehicles or on tours. That was partly the reason why Rolf and I decided to arrive more than a week earlier, to avoid the crowds and take advantage of the bears in peace and quiet. It's from about the first week of November that it starts to get really busy. It's also a gamble because if the winter arrives late then the bears would still be conserving energy and therefore sleeping a lot. 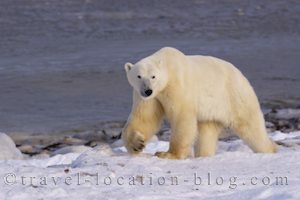 There certainly seemed to be a lot of activity out there today with active polar bears, plus arctic and red foxes. To top off an already successful day, they made a short stop at a group of cute Canadian Eskimo Dog puppies who are kept in a yard in Churchill. Of course, these cute little canines were ecstatic to have company and something new to jump all over!